For a long time, we've been longing for a way for patients to share their unique dry eye journeys with the rest of the world. We're now excited to announce our newest project: dryeyestories.com. We've spoken to you on the phone, read your emails, Facebook posts, and forum posts. Many stories share common elements: quality-of-life changes, lifestyle modifications, depression, stabilization, isolation, triumphs. But each story is unique. It involves problems few know about, care about, or feel they have the power to help. Going into Dry Eye Awareness month, we hope to build a collection of stories that the industry and medical community will have to notice. Just as importantly, we hope these stories will impact others in the dry eye community. So, please, if you have a moment to spare, check out the new site. You'll notice it's a little empty--that's where you come in. If you have a story you think might inspire someone at another stage in their journey, a story that you've been meaning (or needing) to articulate, or need somewhere else to turn, please consider submitting your story. If this sounds like something you're interested in, you can get started at dryeyestories.com/share. And in case you were wondering, you can maintain complete anonymity! We just need you to prepare your story, choose a screen name and answer a few questions. None of your personal information will ever be shared with anyone. 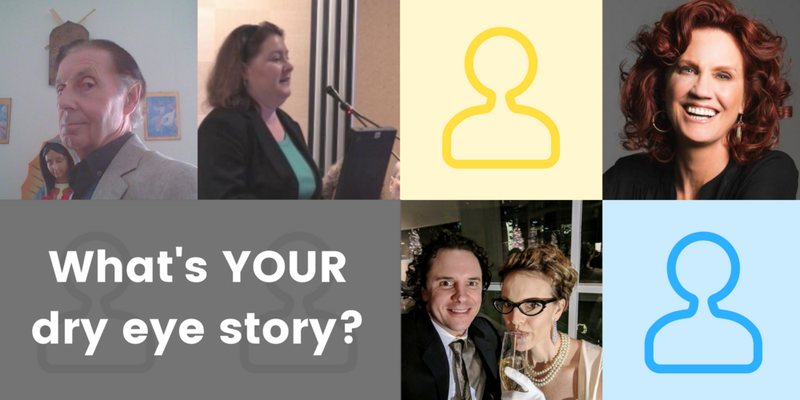 We will use the stories to raise awareness and to make a difference, and we will use your brief questionnaire answers to communicate our needs to dry eye industry stakeholders.